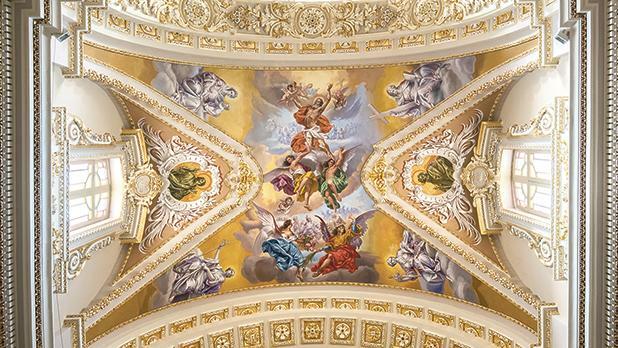 The parish church of Luqa, which was rebuilt after being completely destroyed in World War II, is undergoing a long and laborious embellishment project, with the latest phase completed and inaugurated last Saturday. 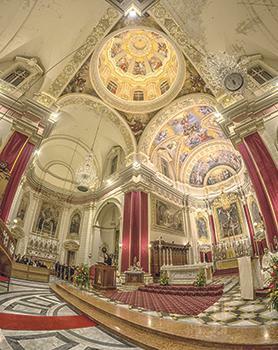 The choir (kor in Maltese) has been decorated with sacred art by Paul Camilleri Cauchi, sculpture by Joseph Micallef and gilding by John Pace. Chev. 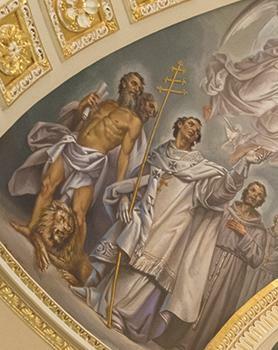 Camilleri Cauchi’s work already adorns various parts of the church, including the cupola, which was completed in 2010. Mr Pace had also been entrusted with the gilding for that part of the project. The artist’s work on the choir can be considered to be a continuation of the titular painting by Mattia Preti, which features the martyrdom of St Andrew. 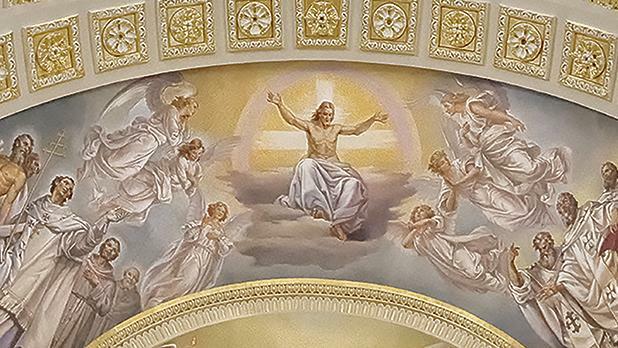 The main scene depicts the apotheosis of the patron saint of Luqa, that is, his ascent to the glory of heaven where he is greeted by Mary, Mother of God, various angels and saints. The latter include archbishops, followers of the apostles and doctors of the Church who spread the Word of God after the apostles. Others include St Helen, who like St Andrew embraced the True Cross, and martyrs St George, St Sebastian, St Catherine of Alexandria, St Lawrence and St Lucy. St Peter and St Paul, considered to be the pillars of the Christian Church, also feature prominently. Another scene shows a resurrected Christ welcoming St Andrew with open arms. Since St Andrew is the patron saint of the Ecumenical Patriarchate of Constantinople, he is portrayed surrounded by a number of saints from the west and east, including St Gregory the Great, St Jerome, St Augustine, St Anastasius of Persia and St Francis of Assisi. Importance was attached to the colours and numbers. These have symbolic meanings, for example, yellow is the colour of light and purity, while green represents the victory of life over death. 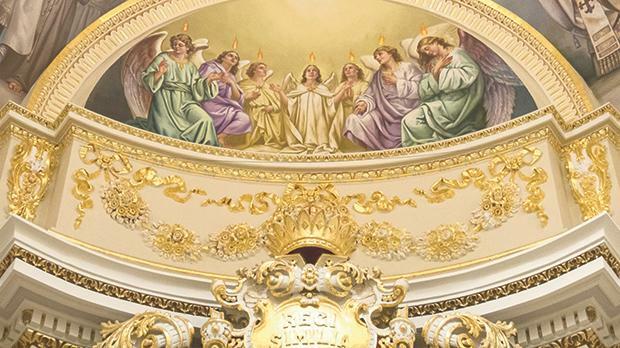 The seven angels with tongues of fire above them represent the perfect number and the seven gifts of the Holy Spirit which St Andrew received during Pentecost: wisdom, understanding, counsel, fortitude/courage, knowledge, piety/reverence and fear of the Lord. The three theological virtues – faith, hope and charity − and the cardinal virtue of justice are also represented. The choir project cost €90,000, with most funds coming from the congregation and a sponsorship by the APS Bank. 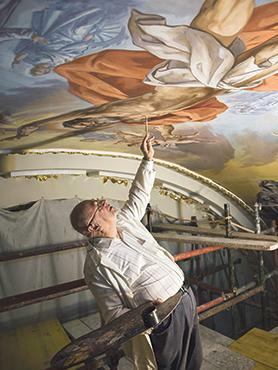 Parish priest Canon Michael Zammit estimates that the church would need between €400,000 and €500,000 more to complete the embellishment project, which was initiated by the late parish priest Fr Joe Camilleri, who died tragically in 2003 after a fall at the Luqa parish centre. This would mainly consist of the decoration of the nave.